OS X got a big update Wednesday morning in the form of Mountain Lion, including support for Documents in the Cloud, Apple’s iCloud service for wirelessly syncing your files between computers. 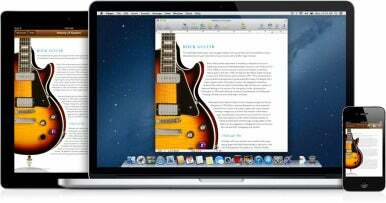 Not to be left in the dust by the likes of TextEdit and Preview, however, the Mac versions of Apple’s three iWork apps also received updates to enable access to files stored in iCloud. Apple prominently featured Pages iCloud sync on its OS X Mountain Lion website. It’s hardly a surprise to see iWork Update 9.2 now: Apple previewed Documents in the Cloud support for iWork at the last month’s Worldwide Developers Conference; the company had also been showcasing a screenshot of Pages synced across all Apple devices on its OS X website. As the iWork apps aren’t bundled with OS X, however, they wouldn’t receive Documents in the Cloud support as part of an operating system upgrade—hence, the separate update on Wednesday. The patch brings support for Documents in the Cloud to Pages, Numbers, and Keynote. 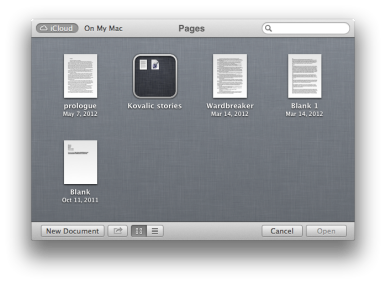 Unfortunately, iBooks Author, the unofficial fourth member of the iWork team, did not receive a Documents in the Cloud-centric update. Documents in the Cloud, which lets apps access files stored in iCloud, works similarly to the iWork apps as it does with TextEdit, Preview, or any third-party iCloud-enabled app. When you open, say, Pages, you’ll be greeted with iCloud’s Document Library and any file you may have created or saved there. The files themselves can be opened, organized by name or date, put into folders—iOS style—by dragging one file on top of another, or distributed via the Share menu. You can also create new files by clicking on the New Document button, or copy a file from your computer—or a different Document Library—by dragging it over to your library. Cloudy, with a chance of documents: Now you can access iWork documents stored in iCloud on your Mac. As the iWork apps are available on both OS X and iOS, they have the added advantage of being able to access any Pages, Numbers, or Keynote file you’ve saved to iCloud, regardless of whether you created them on your Mac, iPad, or iPhone. This makes editing documents between devices that much smoother—and comes in especially handy when you’re trying to tweak that last bit of presentation on your iPhone ten minutes before you’re set to go on-stage. Additionally, the update adds Retina-ready graphics and support for Mountain Lion's new Dictation feature; Apple has released a document on its website with more information. If you own Pages, Numbers, or Keynote, you can download the update for free from the Mac App Store, via Software Update, or a standalone installer on Apple's Downloads page; though you can install the update on Lion, you’ll need to be running Mountain Lion to take advantage of Documents in the Cloud and Dictation. New users can purchase each app in the iWork suite for $10. In addition to the Mac versions of iWork, Apple also released updates to the mobile components of its productivity suite on Wednesday. The 1.6.1 versions of Keynote, Numbers, and Pages work with iCloud to make presentations, spreadsheets, and documents available between your iOS device and your Mac.